Welcome to PCTOnline's webinars. Below, you'll find an archive of our webinar offerings, linking directly to the videos, or in the case of upcoming webinars, the registration pages. Please check back often, as we are continuously updating with new, pertinent industry webinars. The pest control industry owes much of its recent growth to the rapid expansion of various niche markets tied to the industry’s public health mission, including mosquito control, tick IPM, rodent management and perimeter pest control. As a result, more and more PMPs are exploring the benefits of entering these markets or investing additional time and resources marketing these essential pest control services. If you’re considering growing your public health footprint for the 2019 pest control season, you’ll want to attend the PCT Public Health Virtual Conference scheduled for Wednesday, April 17. Representatives from Podium discuss how text messaging can attract business and improve retention. Learn more about Trelona Annual Bait Stations (ATBS) in a webinar featuring BASF's Antonia Chan and Dr. Bob Davis. Learn about Solentra. the new BASF rodent bait product featuring the active ingredient cholecalciferol. Learn about the latest technology being used in closed crawlspaces and best practices for this line of work. Learn how to acquire new customers and manage your online reputation in this informative webinar presented by Podium.. In a webinar sponsored by Syngenta, Dr. Phil Koehler, an endowed professor at the University of Florida specializing in urban entomology, will discuss best practices for managing mosquito populations in 2017 as concerns about the Zika virus and other mosquito-borne diseases continue. Dr. Koehler will cover the following topics during the webinar: Mosquito suppression in suburban and urban landscapes; Application quality and effects on management success for barrier treatments; and a Zika update – what to expect in 2017 and how to prepare your customers. Bayer’s Joe Barile and Dr. Kurt Vandock share best practices for effective and affordable mosquito control. Zoecon's Mel Whitson discusses challenges and solutions for pest issues in commercial accounts..
A webinar sponsored by Valent BioSciences that reviews the nuances of mosquito control, in particular container mosquito control. An Azuga-sponsored webinar on how to manage your fleet and service techs' driving behavior to reduce costs and boost safety, efficiency and service. Lance Holt and Lindsey Kelley of GPS Insight discuss how PCOs can increase revenue by using GPS tracking. Dr. Grayson Brown and Dr. Nicky Gallagher provide application tips and give a mosquito market update in this webinar sponsored by Syngenta. Billy Tesh, founder of Crawlspace Depot, discusses basic training and trends in crawlspace encapsulation, providing information that can help PCOs determine if crawlspace encapsulation is a good fit for their business. In a webinar sponsored by Podium, learn what you need to do to take advantage of the mobile explosion and discover tips and tricks for optimizing your site. Zoecon's Mel Whitson reviews a number of topics related to Zoëcon's comprehensive lineup of pest control solutions and discusses mosquito-borne diseases such as Zika virus. An encore presentation of Liphatech’s Eraticate road show presented by Liphatech’s John Murphy and Ted Bruesch. The webinar reviews how Liphatech’s newest products deliver great results and provide a boost to a PMP’s IPM program. Featuring industry consultant Paul Bello and AMVAC's Jeff Alvis and Charles Silcox, Ph.D., the webinar covered how control tools have evolved and provided insights into a new tool for managing bed bugs, and other pests, NUVAN Directed Spray. Nisus' Rob Schwalb provides tips for fly management in food facilities and discusses how Nisus products are important tools in this line of work. Learn about recent research conducted in the Virginia Tech Urban Entomology Laboratories in a free webinar presented by CIRKIL Rag in a Bag. BASF Pest Control Solutions technical specialist Dr. Bob Davis provides a technical overview on Termidor H•E High-Efficiency-Termiticide. This is one of three regional webinars and for more information about your region, contact your BASF sales rep or call 800-777-8570. Rockwell Labs’ Dr. Cisse Spragins and Mike Tweedy discuss how the company's products are a good fit for PCOs in this current era of label restrictions. Dow AgroSciences presented a webinar for pest management professionals, property managers, facility managers and others involved in termite control. During the one-hour “Baiting Is Best” webinar, two industry veterans — Len Land, CEO of Coppermines Pest Control, and Mark Nadolski, COO of Russell’s Pest Control, Knoxville, Tenn. — shared how termite baits add value for their customers, employees and businesses. BASF has established its leadership in nonrepellent technology with Termidor and Phantom products. A new, non-repellent family of products is emerging that features the active ingredient, dinotefuran. The Alpine family of products will soon feature a water soluble granule product for indoor or outdoor spray treatments. In this hour-long webinar Jeff Tucker discussed products, technology, features, and benefits of the Alpine family. Avitrol is an economical and highly effective product that has been available to Pest Control Operators for over 40 years. Learn how to effectively use Avitrol products in today’s world. Topics to be covered include: What is Avitrol? How does Avitrol work? How will Avitrol affect my bottom line? Will pest birds return? How to bait in difficult areas. What information should I give to my client on what to expect when using Avitrol? CLICK HERE to access this archived webinar. Learn what pest control insulation is, why it is a growing service offering and how it can fit into your business model. Also learn about insulation removal and why it is such a good fit with wildlife as well as rodent service offerings. Rick Harris, a 25-year veteran in the industry who sold TAP for over 10 years for a major PMP will share his experience with this opportunity and give a clear overview of a successful business model that can work for your organization. Call-backs are expensive! 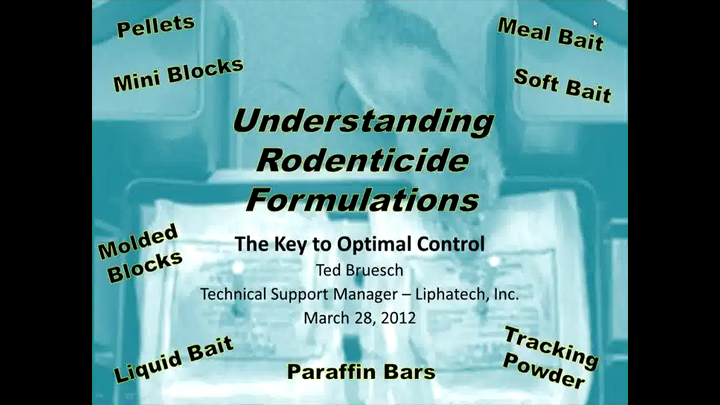 This webinar, presented by Liphatech’s Ted Bruesch, reviews tactics for eliminating rodent infestations as quickly as possible and preventing their recurrence. The session included techniques for house mice, Norway rats and roof rats. Closing crawlspaces can create large ticket jobs for your company, create ongoing renewal revenue and give you a steady source of new customers. This hour long webinar will help you determine if this opportunity is right for your company. Hosted by Billy Tesh President of Pest Management Systems in Greensboro, N.C., and principal in crawlspacedepot.com. Tesh is one of the pioneers of closing crawlspaces and will provide a clear overview of this business model from a management and technician’s standpoint. This webinar is intended to introduce Bedlam Plus to PMPs and educate you about its product advantages and proper use. New Bedlam Plus is the latest bed bug control product from MGK with dual action technology to kill even the toughest pyrethroid resistant bed bugs and their eggs. Rodenticide formulations have certainly changed over the decades. At one point, pellets and tracking powder were very popular; now it is mini blocks and soft bait. Ted Bruesch, technical manager at Liphatech, will explain why different types of product have evolved over time. He also will explain the optimal situations for using different types of modern-day formulations. Brother Mobile Solutions, Motorola, and ScanTrak can help all Pest Control companies create an efficient, ROI Solution for managing their field service teams. This solution consists of the software, handhelds, and mobile printers all designed to meet the tough requirements in the Pest Control Market. Pest management professionals may be spending time reading the headlines about bed bugs, ants and cockroaches, but another pest group is a perennial complaint generator: spiders. Join PCT for an informative webinar on spider biology and integrated management. Learn how to approach spider infestations using IPM techniques from renowned industry consultant Austin Frishman and Joe Barile, technical service lead, Bayer Environmental Science. Basic biology, behavior and management tips will be presented during this webinar. Brother Mobile Solutions, Motorola, and Pest Pac Software hosted a webinar titled “Full Mobile Solution for the Pest Control Market.” The one-hour webinar explains how Brother Mobile Solutions, Motorola, and Pest Pac Software can help pest control companies create an efficient, ROI solution for the field. This solution consists of the software, handhelds, and mobile printers designed for the pest control market. Acclaimed bed bug researcher Dr. Dini Miller, associate professor at Virginia Tech University, presented a webinar titled “A Whole-House Approach to Bed Bug Treatments.” The webinar, sponsored by Dow AgroSciences, reviews how fumigation is a comprehensive and efficacious bed bug treatment strategy. The webinar also focuses on the need for PCOs to communicate effectively with residents, which Miller describes as one of the major bed bug treatment challenges she’s observed.